Long after most people thought the silent movie had been buried forever, Chaplin brought his "Little Fellow" out of mothballs for one more magnificent motion picture. 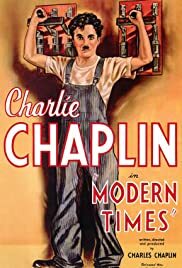 The Tramp is trapped in a factory, performing mind-numbing repetitive tasks, and finally he goes hilariously berserk. I started laughing the instant I saw the lady in the dress with the buttons. Like "City Lights," this film is a collection of charming vignettes, this time revolving around The Tramp's desire to settle down with gamin Paulette Goddard. From the Tramp's encounter with an assembly-line "feeding machine" to his unsuccessful stints as night watchman and waiter, this movie is packed full of delights. Chaplin never speaks, but he does sing a little. This work of genius can make you smile though your heart is breaking.